Recently been seeing people uploading their composite shots of the moon and made it bigger. So I thought I’ll give it a go since the moon in this panorama was a tiny little fleck as seen in the photo below. Here are 2 composites of the panorama and a photo of the half eclipse and then the full eclipse. Do you like composite shots? If so, which one do you like best? or do you prefer the panorama with the tiny little moon just visible because it’s red? Here is my photo of the Super Blue Blood Moon Sunset; NASA is calling it a lunar trifecta: the first super blue blood moon since 1982. That combination won’t happen again until 2037. I was so blessed to be able to partake in this beautiful event with close friends. Instead of just photographing the moon, Here is the Super Blue Blood Moon Sunset above Perth city with yachts sailing around at sunset! That is what I find exciting! 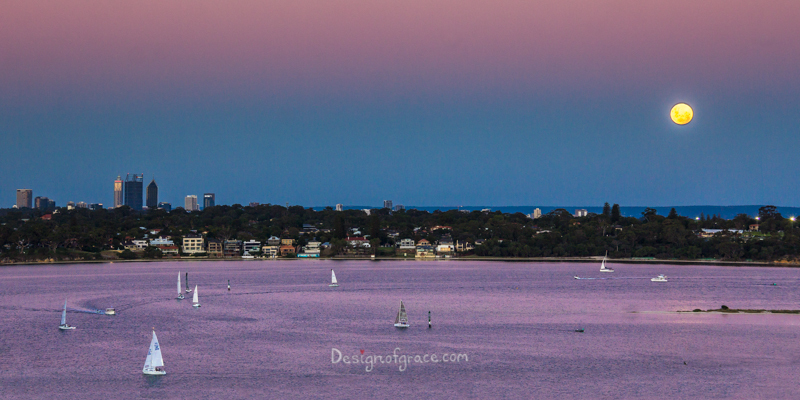 The moon and our beautiful colourful sunset and in this instance, the city of Perth in the backdrop! That to me is the tri-factor with the yachts on the water as a bonus element! I intentionally kept the photo dark so that you can see the details on the moon better. Part of me is disappointed that the moon was not blue in colour since blue is my favourite colour! As the moon rises, I was finding it harder to have the moon and the city in the same frame. We stayed till about 11:45 pm and got lots of photos of the lunar eclipse. I also did a night panorama of the scene with the moon but the moon was tiny and was very bright so as to capture the surrounding nightscape. If you like this photo, contact me to purchase a print. We happened upon Meelup Beach in Margaret River in the South West Region. I love to share with you this spectacular sunset from a beach in WA. Can you recognize where this beach is? We have such spectacular sunsets in our backyard. It changes every day. I find that so inspiring!